I begin my soft pastel paintings by preparing a museum board with a mixture of gesso, pumice ,and water. This texture can be observed as a pattern of swirls, as it is applied with a broad brush. The next step is to completely underpaint the board in vivid, even garish, complementary colors of acrylic paint. So, for example, if the subject was to be green grass with darker shadows, the underpaint would be shades of red. The pastel is applied in layers, working from dark to light. Generally the pastel covers most of the acrylic, but some pieces I use metallic acrylic for the skies, and these stand alone. I use many brands of pastel, checking each one for colorfastness, so that I am able to assure the permanence of my pastel paintings. Born in Illinois, Beth lived in Colorado, California, and Maryland before moving to NYC. She attended the High School of Art and Design where she studied art for four hours a day. After art, Beth often cut her other classes to spend the rest of the day at the Metropolitan Museum of Art, where she was inspired and intimidated by the great Masters of Impressionism. She attended Friends World College, and lived in Mexico, East Africa, and India for several years, before finally settling in West Virginia with her husband, a fellow artisan named David Wentz, in 1977. Their son Nathanael was born in 1981. It is there that Beth enjoys gardening, especially daffodils which are not tasty to deer. Ms. Crowder began her career in art while still in Denver, painting portraits and often making courtroom sketches for television. From this beginning, Beth dedicated many years to the art of portraiture before turning to landscape in the early nineties. Her award-winning pastels have been featured at Tamarack in Beckley, WV. , Mountain Made, in Thomas,WV ,and the Dept. of Culture & History in Charleston, and many are part of the state’s permanent collection. 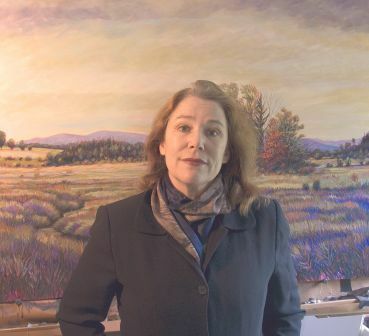 Her large pastel,"Parody on the Grass" is part of the permanent collection of the University of Charleston, WV. She exhibits her new work in art festivals and galleries throughout the country.